Have a Rodent Problem? Call Lloyd Pest Control Services Ltd.! Do you think you have rodent problem? Contact Lloyd Pest Control Services Ltd. to inspect your property and determine a viable solution. We also encourage you to read the common characteristics of mice and rats found below so you’re more familiar with the problem at-hand. Often found in urban areas, the common house mouse has large ears and is usually light brown to dark grey with a lighter colour on its belly. The deer mouse is usually brown or grey with a white belly and feet, and the telltale white colour on the underside of the tail is an easy way to spot one. It may invade buildings near fields or woodlands in the fall. A rat is larger than a mouse, weighing up to 0.5 kilograms (1 pound). While the Norway rat and the roof rat may appear similar, their habits are different. The Norway rat tends to build elaborate systems of tunnels and burrows at ground level, preferring damp areas such as crawlspaces or building perimeters. The roof rat is typically a more agile climber, preferring to live in trees, vines or other dense vegetation. 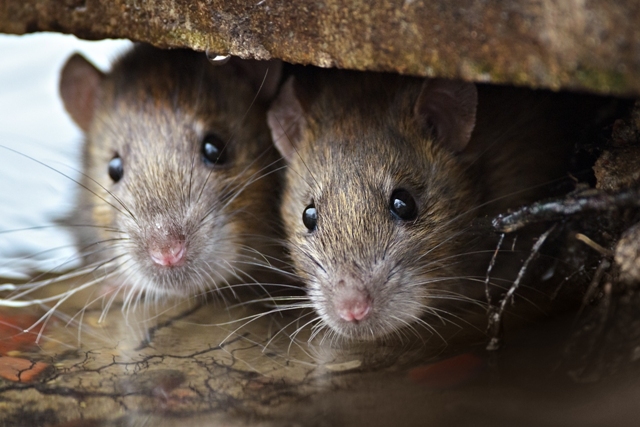 Roof rats infest attics, rafters and roofs, as well as upper stories of buildings. Indications you may have an infestation include scampering and scratching sounds inside your walls, signs of chewing or gnawing and damaged food packages. Other signs include droppings and urine, burrows or holes in and around your foundation walls or tracks left on dusty surfaces. Because mice and rats are prolific breeders, it’s best to tackle the problem of an infestation right away. Mice and rats are also carriers of diseases and can damage your property. The deer mouse is the most common carrier of the deadly Hantavirus. We would be happy to help you with this problem in a phone call, an email or a visit to our store. Contact us today!